Can I use Wifi for free? Yes, you can connect to our free WiFi that covers anywhere in the house. Is there an air conditioner in the room? Yes, there are air-conditioners in all rooms and dormitory. Do you have a desk or a table in the room? Yes, there is a desk or a table in every bedroom. In Japanese style rooms, there is a low table with floor cushions. Are bathrooms and showers shared? How many are there? Bathrooms and showers are shared. There are 3 bathrooms and 2 shower facilities in the house. Yes, we do have 2 communal kitchens which are available for use at any time. Kitchens contain, electric cooker, fridge, oven, pots pans and kitchen utensils. We also provide free tea and coffee. Are laundry and dryer facilities available? There is a washing machine. 200 yen per wash. Dryer is not set at the house. There is a roof terrace that you may use to dry clothes. What is the difference between staying in a share house and a program-inclusive stay? Staying in a share house is a standard occupancy. A program-inclusive stay is a set that combines a room and various programs (language classes, cooking classes, sightseeing, etc.). What is the minimum number of people required for a program to run? The minimum number is 2 people. If we have not reached this minimum by one week before the start of a program, then the person who has applied will be offered a choice between either a private program or a stay that does not include normal programs. Also, a private program will be charged a higher rate than normal programs. Can I get a student visa if I participate in a language program? Participating in this program, you will not be issued with a student visa. We ask all participants to arrange for a required visa (tourist, working holiday, etc.) on their own. Is it possible to participate in the program only with my family or friends? Yes. We can arrange the program If 4 or more participants applying. Is it possible to stay in the share house at the conclusion of my program? How should I apply for this? Yes, it is possible to stay in the share house at the conclusion of your program. When booking a program, please fill in your application to that effect. How can I apply a residence with programs? Please send us booking information through reservation form on each program information page. How do I book the Avocado village? The minimum is one month (4 weeks). Do the rooms need to be rented in units of one month (4 weeks) ? They do not. For example, if your stay is 1 month and 10 days in duration, the 10-day period will be calculated on a daily basis. E.g., A stay of 1 month and 10 days in a room costing 45,000 JPY. 45,000 + (45,000÷28 days×10 days) = 61,000 JPY. Will my deposit be refunded if I cancel my reservation? The deposit of 30,000 JPY will not be refunded under any circumstances, irrespective of the reason for canceling. When do I need to inform you of my departure date? Please inform us of your intention to leave your room a minimum of 4 weeks in advance. If you should leave in sudden circumstances, 4 weeks’ rent will apply from the date on which you informed us of your intention to leave. We accept rent payments via bank transfer, Visa or Master card. We will issue you with a monthly invoice via e-mail. For the first month of your stay, please pay the rent by cash on the day that you move in. Can the share house be chartered? A charter can be arranged for groups of 10 or more. The minimal rental period is also 4 weeks in the case of charters. For more information please contact us. What is a dormitory room? This is a room that is shared by up to 4 people. Each room has 2 bunk beds. We do not rent out to persons under 18 years of age. We accept persons aged 14 or over only if they are accompanied by a parent. They will be charged at the same rate as an adult. Is it possible to have friends or family members stay in my room? Visitors may come and go freely between 9:00 a.m. and 9:00 p.m. Visitors staying after 9:00 p.m. will be charged a fee of 3,000 JPY per night. Is it possible to have 2 or more people staying in the one room? 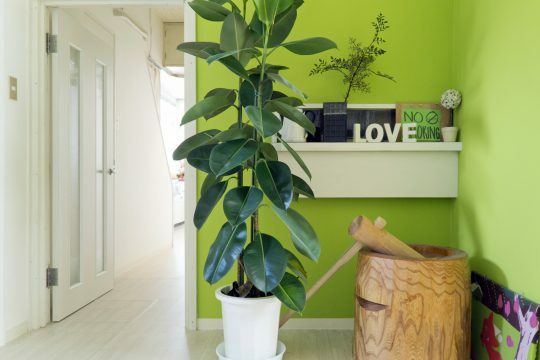 Japanese-style rooms can accommodate 2 people. Dormitory rooms can accommodate up to 4 people in the one room. Is bicycle, motorbike, and car parking available? You may park your bicycle or motorbike free of charge. We have one car parking space (fees apply) available, so please make an inquiry when you apply to stay. There is no parking for large vehicles. What is the closet international airport? The closest international airport to Avocado Village is Kansai International Airport (KIX). It is one and a half hours by bus or train from the airport. Please see our “Access from various quarters” for more information. Does a shuttle bus run from the Airport? We are sorry we don’t have shuttle bus. But there is charged shuttle bus service directly from Kansai International Airport to the Avocado Village. Are there supermarkets and restaurants nearby? Yes, Avocado house within walking distance of shopping, restaurants. View more information at hear. Is it a convenient location for sightseeing? Avocado Village is located the south of Kyoto and 5min Walk to subway station. So you can access many sightseeing spots. View more information at hear. Live and learn together with the locals in a multicultural share house! Please confirm before sending the form. Thanks for contacting us. We will reply to your inquiry within 3 working days. © 2019 https://kyotohomestay.com, All rights Reserved.